In 2004, John Wallace was relocating from one coast to the other, and he thought it was good time for an extended vacation. "I didn't have a job, I had a chunk of time." So he decided to run from Washington State to Georgia. "It just seemed like a good way to have a fun adventure across the U.S."
That got him wondering who else had done it. "I just started doing a whole bunch of research online, you know, going through old newspaper websites, and talking to other crossers. And it just became like a full-time thing." To date, according to Wallace, 236 people have made the 3000-mile journey on foot, with the first crossing on the books in 1909. Each summer, a handful of runners set out from one coast or the other, and many pass through Missouri. I met up with one of them for breakfast in Columbia recently. Chris Nicholas. The deeply tanned Michigander started his run in Washington, D.C., on March 24, and he's aiming for the Pacific Ocean by early June. Breakfast is important if you're going to run 35 to 40 miles a day, Nicholas told me. "I've got a couple glasses of orange juice, some oatmeal with brown sugar and some almonds, three yogurts, some eggs, some potatoes, and a pastry just to top it off today." It was a cool, bright blue morning when Nicholas headed west out of Columbia. But the din of traffic and narrow roads made conversation hard. "You know, I think the hardest part has been – well, I think there's a couple of aspects," Nicholas said, mulling them all. "One would be you know, avoiding dogs." Nicholas's run is raising money for children's hospitals, but on a personal level, he said it's about setting goals and attaining them. Unlike a lot of the other crossers, Nicholas is running totally on his own. All his gear – food, shoes, tent, Gatorade powder – it's all in a jogging stroller he pushes in front of him. "I think the hardest part has been, just to realize, or focus on knowing that I'm gonna be out there for so many hours a day, and if I keep looking at the clock, I'm not going to get any farther." If it's hot, or hilly, he said, he'll slow down or walk. "I'm not running a race while I'm out here." But some people are racing. The current world record was set back in 1980, by a man named Frank Giannino. "What happens with these things is as you start to do them supporters, doubters, whoever you talk to, starts to ask questions, like, 'Are you gonna set a record?'" said Giannino. Giannino's mom had died of breast cancer a few years earlier, and he thought running across the country would be a good way to call attention to the cause. He ran from San Francisco to New York in just 46 days – about 70 miles a day, with no rest days. I asked him why no one has broken that record in the past 32 years. "They gotta run faster," he said. "In a run like this, all of your demons come to the surface. The bottom line is, you're going to have to deal with yourself out there." These days, Giannino runs a shoe store in New York, and he says, if you're thinking about running across the country, you should get in touch. "If I have any message for your listenership, it is that life is short, make it happen. And if you ever want to call me up in New York, I'll give you my phone number." Athena Papadopoulos is running west from Florida to San Diego to raise support for clean drinking water in Africa. 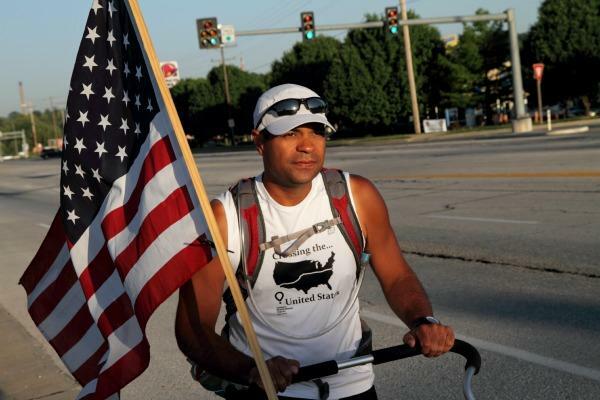 John Pyle is running east from San Francisco to Florida to raise money for wounded veterans. Colon Terrel is walking west from North Carolina to Santa Monica, California to support heart health. Jamie Summerlin is running east from Oregon to Annapolis to support wounded veterans. Currently at least 14 others are planning runs this summer, including Steve Knowlton, who plans to obliterate Frank Giannino's world record, to raise money for Asperger's Syndrome.